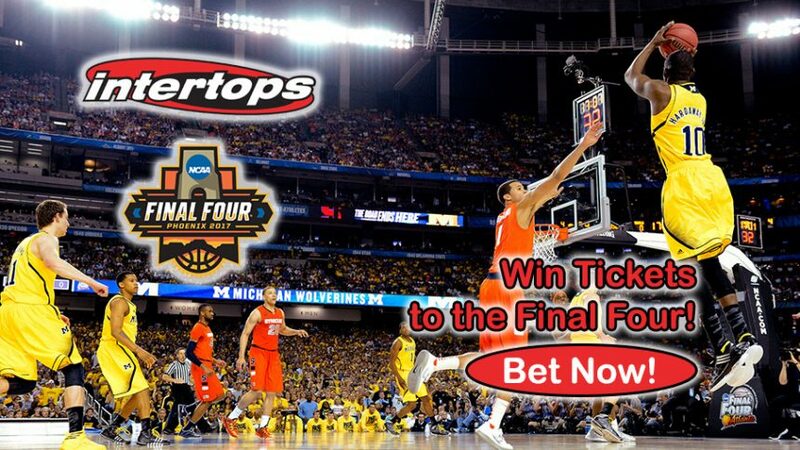 Get your hands on NCAA Final Four Tickets by betting on the hottest college basketball action with Intertops! Make the most of your time with hoop bets to win two NCAA Final Four Tickets, so you and your buddy can watch all the action live at the University of Phoenix Stadium. Join Intertops Sports ASAP and take advantage of this great offer! To qualify for the NCAA Final Four Tickets, all you have to do is place wagers on college games from now until the end of February 2017, and then sit back and reap the benefits twofold: winnings from your betting exploits and tickets to some of the greatest hoop action in the country. Every $1 that you bet on the NCAAB Regular Season until February 28, 2017, will see you earn a chance to win the in-demand NCAA Final Four Tickets! So what are you waiting for? Wager today and tomorrow and then every day after that until the end of the campaign to witness March Madness live. Besides the two NCAA Final Four Tickets (semi-finals and national championship game), your winning package also includes a 4-night hotel accommodation, VIP Experience Access to the Final Four Fan Fest and also expenses for your flights. As you can see, Intertops will take care of everything; all you have to do is select the best college basketball games and place wagers on them to scoop two NCAA Final Four Tickets. Duke are the favorites to win +350 (4.50) the tournament outright, while Kentucky is right behind them on the odds chart with odds of +700 (8.00). Kansas are third on the chart +900 (10.00), whereas Villanova +1100 (12.00) and Michigan State +1600 (17.00) are underdogs for the title. Villanova are the defending champions, having won only their second championship last year, with their first coming 31 years prior. Duke – the team that are favourites this season – have won the tournament on five occasions (1991, 1992, 2001, 2010 and 2015), ranking third behind only UCLA and Kentucky with 11 and 8 championship respectively. If you’re more into football than basketball, then you surely must check out Intertops’ Super Bowl Ticket Lottery – this promo is open until January 2, 2017, giving you the chance to win 2 tickets to Super Bowl LI. Wager every chance you get to get the NCAA Final Four Tickets! Win NCAA Final Four Tickets!